Among all recognized climate forcing mechanisms, aerosol indirect effects are currently the greatest source of uncertainty in model forecasts of climate change. In recent years vigorous research has ensued focusing on key unanswered questions that persist due to limited laboratory and field observations of aerosol-cloud-precipitation interactions. As one of the four major terrestrial sources of atmospheric aerosols (desert dust, biomass burning, biogenic and anthropogenic air pollution), mineral dust is responsible for significant climate forcing through direct effect on solar and thermal radiation as well as indirect effect on clouds and precipitation processes. 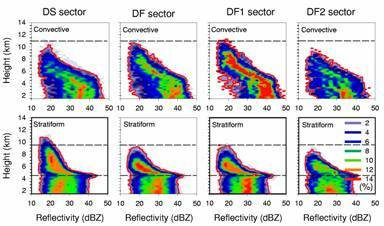 We have used multi-platform and multi-sensor observations to investigate the impact of mineral dust on cloud microphysical and precipitation processes in mesoscale convective systems. For a given convective strength, small hydrometeors were more prevalent in the stratiform rain regions with dust than in those regions that were dust free. Evidence of abundant cloud ice particles in the dust sector, particularly at altitudes where heterogeneous nucleation of mineral dust prevails, further supports the observed changes of precipitation. The consequences of the microphysical effects of the dust aerosols were to shift the precipitation size spectrum from heavy precipitation to light precipitation and ultimately suppressing precipitation. In addition to microphysical changes in clouds, changes in nucleation processes of ice cloud due to aerosols would result in substantial changes in cloud top distribution as mildly supercooled clouds are glaciated through heterogonous nucleation processes. Using measurements from multiple sensors on multiple observing platforms over the Atlantic Ocean, we found that the ice cloud effective temperature increases with mineral dust loading with a slope of +3.06C per unit AOD. The macrophysical changes in ice cloud top distributions as a consequence of mineral dust-cloud interaction exert a strong cooling effect (up to 16 wm-2) of thermal infrared radiation on cloud systems. Induced changes of ice particle size by mineral dusts influence cloud emissivity and play a minor role in modulating the outgoing longwave radiation for optically thin ice clouds. We proposed a new indirect effect: Longwave indirect effect of mineral dusts on ice clouds. The proposed cooling forcing of thermal infrared radiation due to mineral dust would have significant impacts on the cloud system and its evolution globally. This may also represent another mechanism by which anthropogenic activities are perturbing the climate. Ice clouds and associated longwave radiation forcing. We also combined satellite observation with in-situ measurements during the VOCALS field campaign to study aerosol indirect effects on warm clouds.